The Musket V twin. Two hearts that beat as one. 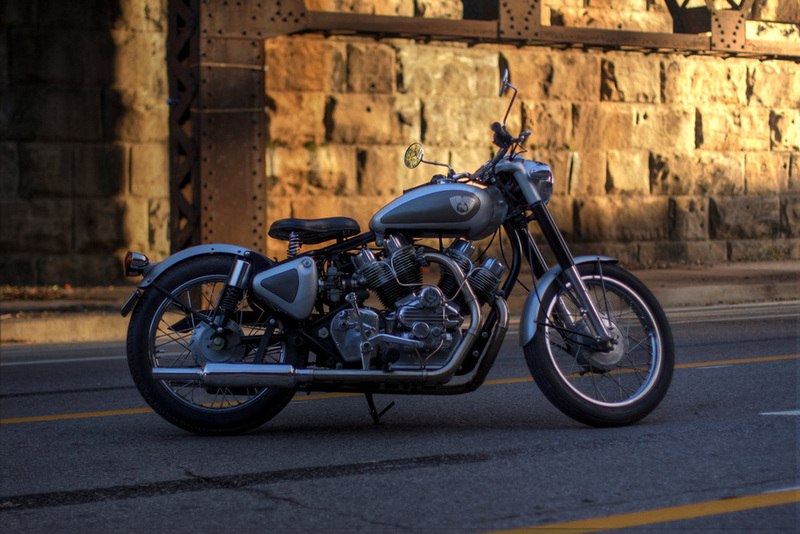 The Musket V twin is transport for your soul. It is an engine designed with firm, uncompromising love for the simplicity, honesty and timelessness of machines from the golden age of British V twins. 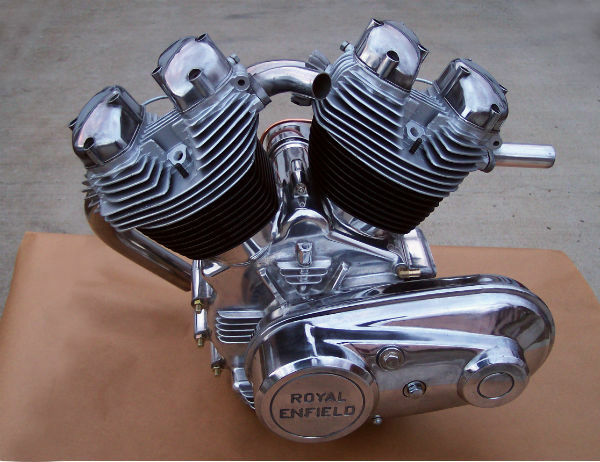 Based on the internal components of the classic iron barreled Royal Enfield Bullet, it is an attempt to make something in the manner that "they" would have made "back then". It is designed to accept the stock transmission and clutch and drop into a stock Bullet with a stretched frame top-tube. British parallel twins are plentiful but Vs like the ones made by Vincent, Brough, Matchless or AJS are extremely rare and expensive. 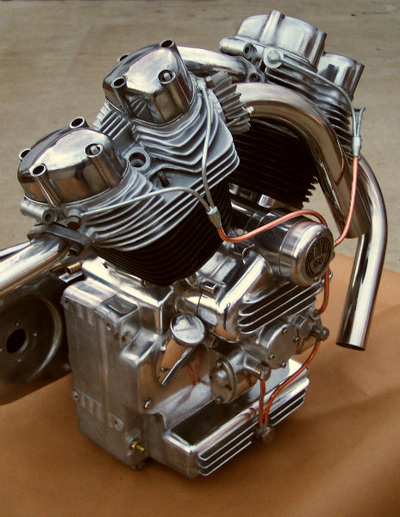 The Bullet engine, with it’s steady supply of affordable spares and undeniable old-school charm, performance parts availability and utter simplicity, is a sound basis for a really cool ‘other’ vintage v twin. One that you could build and ride without breaking the bank. Just like a Vincent, both exhausts exit forwards due to the front and rear heads being the same. This factor is distinctive and immediately calls attention to the engine as virtually all other Vs have a central carb, mirrored heads with exhausts exiting forward and rear. After the very successful first prototype, the 700, which has covered more than 10,000kms and is in regular use, the engine was completely redesigned from a production standpoint. A result of more than two years of considering feedback, design development, detail refinement and painstakingly fabricated all new casting patterns, this is ready and roaring. Compared to the first Musket's 70 deg, a more compact 59 deg. 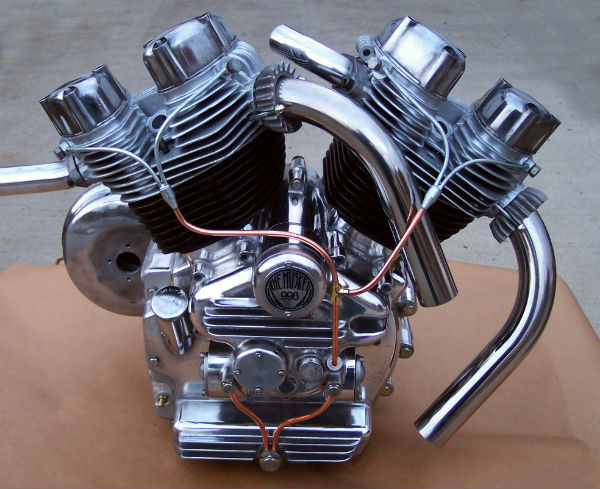 V angle leads to much simpler installation, a reduced top tube stretch and an aesthetic more true to vintage V twin roots. This new crankcase can be machined to accept either 350 or 500 top ends, allowing riders the option of a 700 or 1000. This new motor was installed into the frame of the test machine - a 2002 Bullet 500. A modification of the frame's down-tube resulted in a stretch of only 2.3". The test machine has been running very well and has completed 11,000 miles as of September 2014.